Please choose your favorite chip style above by clicking on the style options. All 500-chip poker sets come packed with premium quality 11.5 gram or 14 gram (if you choose the 12 stripe clay chips) poker chips that feel and sound like casino chips. Our high premium chips are set apart from the competition with their attention to detail and use of quality material. Each chip set includes a heavy duty alumimum case with capacity for 500 chips. 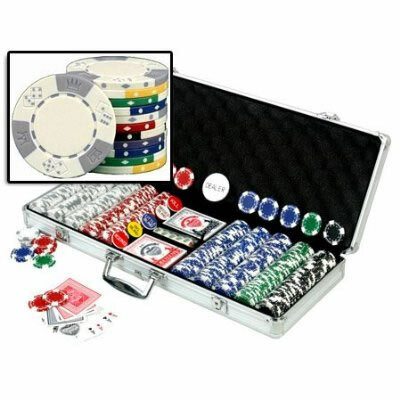 Also included are a pack of 6 poker dealer buttons, 2 decks of playing cards, and 5 dice. Please note that playing cards may or may not be cancelled casino cards.